On a baking sheet in separate areas, place the bread, almonds, hazelnuts, garlic cloves with their skin on, and tomatoes, cut side up. Place in the 375 degree oven. After five minutes, turn the bread over and gently toss the nuts. After another five minutes, remove the bread and the nuts. Continue to roast tomatoes and garlic for another twenty minutes, for thirty minutes total. Cube toasted bread, and place in a bowl to soak with the sherry vinegar. Bundle the hazelnuts in a kitchen towel and rub vigorously to remove the skins. Set aside with the almonds. Cut the spaghetti squash in half lengthwise. Scoop out the seeds and stringy flesh surrounding the seeds. Rub the inside of each half with olive oil and place, cut side down, on a baking sheet. Set aside. To remove the skin from the red peppers: On a grill, the flame of a gas stove, or under the broiler, thoroughly char the skin of each pepper, turning frequently as needed, until black and blistered all over. Transfer the pepper to a bowl covered with a kitchen towel, or a paper bag, and allow to steam for ten minutes. The charred skin should then rub off easily, rinsing briefly under running water if needed. Remove core and seeds and roughly chop. Set aside. When roasted for thirty minutes total, remove tomatoes and garlic from the oven. Place the spaghetti squash in the oven and roast for 35-40 minutes, until skin of the squash slightly gives when pressed with your finger. In a food processor, (mortar and pestle, or Vitaprep for a super silky sauce), combine toasted almonds and hazelnuts, bread soaked with vinegar, tomatoes, roasted garlic with skin removed, roasted red peppers, paprika, and salt. Blend until as smooth as possible. With the machine running, slowly stream in the olive oil until all incorporated. 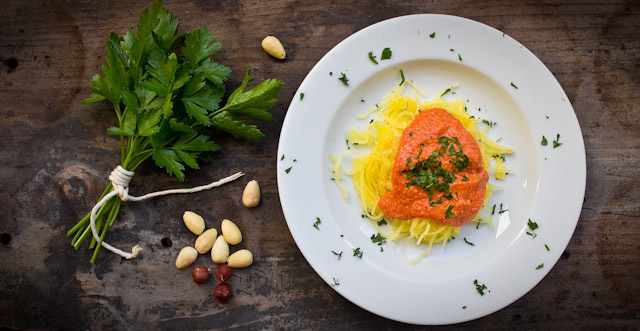 Serve spaghetti squash warm topped with romesco sauce. Garnish with chopped fresh parsley or additional chopped toasted nuts, if desired. 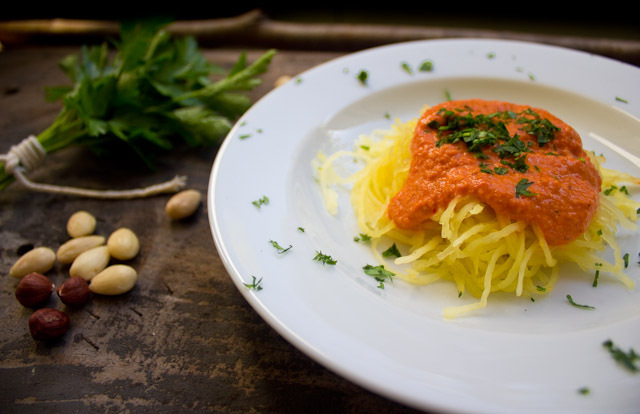 I love romesco sauce, what a good idea to serve with spaghetti squash.